Posted on September 23, 2015 by staceyanderton1	in Features, News and tagged #babynorwood. 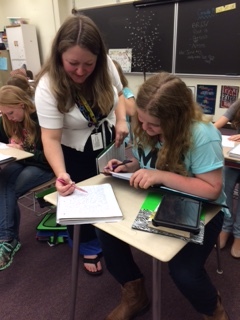 Mrs. Norwood, who is expecting a baby in Novemeber, is helping a student in her communications class. “Potentially I could’ve gone without knowing the gender, but I like being able to make preparations. My husband really wanted to know, though,” said Mrs. Susan Norwood, English and communications teacher, who is preparing to welcome a little girl in November. At this point, the baby’s name is still undecided. “We have it narrowed down, but we don’t want to say until she’s born because then you get some people who are like ‘Oh you don’t want that name. I knew a girl with that name and she was awful.’ Our code name for the baby is ‘Rory.’ It’s my favorite character from ‘Gilmore Girls’ and my husband won’t allow me to name her it.” “Rory” is due to arrive on November 11 and will be born at Meadville Medical Center.